The objective of MISP is to foster the sharing of structured information within the security community and abroad. 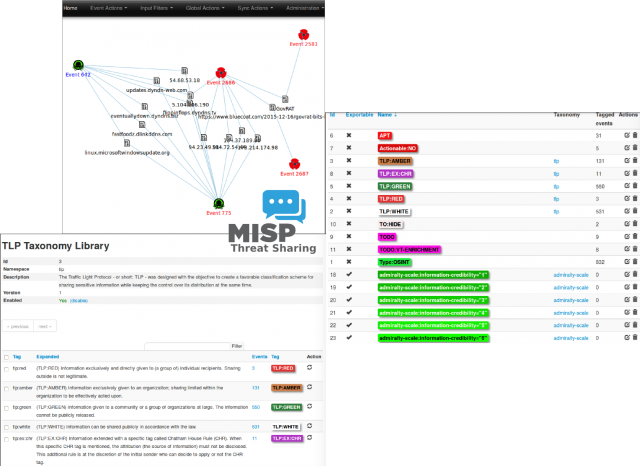 MISP provides functionalities to support the exchange of information but also the consumption of the information by Network Detection Intrusion System (NIDS), LIDS but also log analysis tools, SIEMs. Automatic correlation finding relationships between attributes and indicators from malware, attacks campaigns or analysis. import: bulk-import, batch-import, import from OpenIOC, GFI sandbox, ThreatConnect CSV. STIX support: export data in the STIX format (XML and JSON). Serious ImageMagick Zero-Day Vulnerabilities – ImageTragick?